Looking for something romantic to do this Valentine's Day weekend? Why not go to a boat show? Don't you just LOVE going to boat shows? We are prepared to get some fan mail from some of our readers who will suggest a few things that are more romantic than a date at a boat show, but think about it... Valentine's Day is an especially wonderful time for a boat show. Where else can you and your loved one stay close to home and spend an afternoon or an evening dreaming of all the fun and romance you can enjoy on your next new boat? 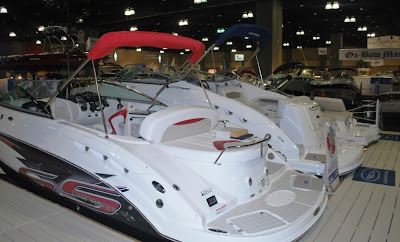 You can go to dinner and a movie anytime, but the boat show comes to town only once a year. This weekend's domestic boat shows are in St. Louis, Fort Wayne, Lexington, Biloxi, and Detroit - a town that seems like it got a lot more famous, or at least a little more respect, from one of the most popular Super Bowl TV ads that aired last Sunday. This is the Motor City. And this is what we do. Loved it! Boat shows outside the US this weekend include the Goteborg Boat Show, the Eurasia Boat Show, the Helsinki International Boat Show, Boot Holland and the Belgian Boat Show. Details for all of these boat shows, and other upcoming events, can be found on our boat show calendar. If you've been following our boat show reports the past few weeks or if you ever check FirstBoat on Facebook, you may have already seen our pics from the Hartford Boat Show, the New York National Boat Show, and the Providence Boat Show. Happy Valentine's Day, and Happy Boating! Almost missed the Boatbuilders Show on Cape Cod. Thanks to our friends at boatingLOCAL.com for the reminder! Also forgot the big show in Virginia Beach this weekend, the Mid-Atlantic Sports and Boat Show.